Warehouse pick up price Now ($4199.00). Introducing Forward® Lift's F12 12000lb. 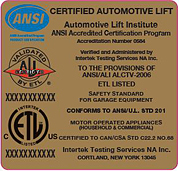 capacity ALI Gold Certified Two Post Lift for raising most passenger cars, trucks and vans. The F12 offers a NEW Lower Pad Height of 4 3/4", Single Point Lock Release, Free Truck Adapters and New Adjustable Width and Height. For warehouse pick up at our Texas or North Carolina warehouse call for pick up price ($4199.00), make payment and schedule a pick up appointment. The Forward® Lift F12 is a ALI Certified 12000 lbs. Capacity Two Post Overhead Truck Lift. The F12 is designed with symmetric arms making it the solution for servicing and maintaining Heavy Duty Trucks and Fleet Vehicles. When considering a 12,000-lb. capacity 2 post lift, do your homework and buy only "Certified" from a known quality manufacturer such as VSG/Dover. The F12 is manufactured by the VSG* division of the Fortune 300 Dover Corp. (NYSE:DOV). Based Here, Certified Here and Insured Here in the USA. Dover is the Largest Lift Manufacturer in the World and enjoys over 80% market share of the car dealership business in this country. Why? Because they take care of business, before, during and especially after the sale. You simply cannot get the "Peace Of Mind" from any other lift manufacturer than you have when you own a Dover product. Over 80% of car dealerships get it right and "Get It Up" with Dover. The F12 has two piece column construction with an overhead which provides a clear floor leaving no structure on the floor between the posts making for a friendly workspace. The Overhead structure has a padded automatic shutoff for taller vehicles. The F12 comes with 4 – 4 1/2” and 4 – 8 1/2" pin style truck adapters. The Adjustable Truck Adapters coupled with a low pad height of 5” allows for a tremendous range in lifting capabilities. Single point lock release system has been added to Forward two post lifts to improve n bay efficiency. Direct Pull cylinder design coupled with single point lock release make for a safe and efficient lifting and locking operation. The F12 is warranted by Forward Lift's 5 structural parts warranty, 18 months for all other components (power units, cables, cylinders, arms etc...) and 6 months labor costs. Note: The Forward® Lift F12 requires a minimum depth of 6” with a minimum 3000 psi compressive strength. Forward® Lift – Engineered to Perform, Built to Last! Overall floor width: 140" or 146"
Inside column width: 114-7/8" or 120-7/8"
Drive Through Clearance: 102-3/4" or 108-3/4"
Front arm reach: 35" to 54"
Rear arm reach: 35" to 54"
Adapter extended heights: 3-1/2", 5"
The Forward® Lift F12 is proudly manufactured by Dover Corp.'s Vehicle Service Group (VSG). VSG comprises nine major vehicle lifting and collision repair brands: Rotary Lift, Chief® Automotive Technologies, Forward® Lift, Direct-Lift®, Hanmecson®, Revolution® Lift, Elektron, Blitz® and nogra®. Based in Madison, Ind., VSG has operations worldwide, including ISO 9001-certified manufacturing centers in the U.S., Europe and Asia. Life is Good with this one! It is great for the long wheel based one ton trucks! I love this lift. Trucks don't wobbled when up in the air. I wouldn't trade it for anything. I wish I had known there were 3 different size of cables when I ordered it.